Interstate Removalist Sunshine Coast – Moving to or from Sunshine Coast? We’ve got you covered. If you’re looking for a Sunshine Coast Removalist you can’t go past 1800 Removals. We quote our Sunshine Coast removalist to include two men for your local removal, however you can always hire an extra removalist to get the job done faster. 1800 removals can help your with your removal of a unit or 2 bedroom houses with a small truck, 3-4 for bedroom house with the medium sized trucks or a large 5+ bedroom home with the large trucks. Otherwise at a cheaper rate we can supply just one man and small truck. Sunshine Coast is a metropolitan area and the third most populated area in the Australian state ofQueensland. Located 100 km (62 mi) north of the state capital Brisbane in South East Queensland on the Pacific Ocean coastline, its urban area spans approximately 60 km (37 mi) of coastline and hinterland fromPelican Waters to Tewantin. The estimated urban population of Sunshine Coast as at June 2014 was 297,380, making it the 9th most populous in the country. The area was first settled by Europeans in the 19th century with development progressing slowly until tourism became an important industry. The area has several coastal hubs at Caloundra, Kawana Waters,Maroochydore and Noosa Heads. Nambour and Maleny have developed as primary commercial centres for the hinterland. The Sunshine Coast is a centre for tourism, attracting more than 3.2 million visitors a year. There are significant attractions, such as Steve Irwin‘s Australia Zoo, UnderWater World marine park, Aussie World with the Ettamogah Pub, The Buderim Ginger Factory, The Big Pineapple, the Eumundi Markets and the Majestic Theatre at Pomona. Sports tourism is supported by several annual sporting events such as Mooloolaba Triathlon, Noosa Triathlon and Sunshine Coast Marathon. James Cook on the deck of HM Bark Endeavour in 1770 became the first known European to sight the Glass House Mountains, located south-west of Caloundra. In 1842, Governor George Gipps had the entire Sunshine Coast and hinterland from Mt Beerwah north to roughly Eumundi declared a “Bunya Bunya Reserve” for the protection of the bunya tree afterAndrew Petrie advised him of the importance of bunya groves in Aboriginal culture. However, during the 1840s and 1850s, the Bunya Bunya Reserve and its vicinity became the scene of some of the most bitter skirmishes of Australia’s “Black War“. The Blackall Range, on account of the tri-annual Bunya Festival, served as both a hideout and rallying point for attacks against white settlement. 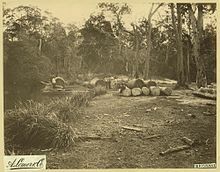 By the 1850s timber cutters and cattlemen had started exploiting the area; in 1860 the Bunya Bunya Reserve was scrapped. The Sunshine Coast’s major university is the University of the Sunshine Coast with its main campus at Sippy Downs.Central Queensland University also has a campus in Noosa. TAFE Queensland services the Sunshine Coast and Wide Bay regions through TAFE East Coast, with four Sunshine Coast campuses at Mooloolaba, Maroochydore, Nambour & Noosa. The Sunshine Coast has many varied denomination, private and public primary and secondary schools (see List of schools in Sunshine Coast). The Lexis English group, providing English classes to international students, has campuses in Noosa and Maroochydore, while Lexis TESOL Training Centres provides teacher training programs such as the Cambridge CELTA and TESOL. The car is the predominant mode of transport for Sunshine Coast residents, with the region connected to Brisbane via the Bruce Highway. The Nicklin Way &Sunshine Motorway are the major arterial roads, which pass through most major areas of the Sunshine Coast. Many intercity and interstate coach operators also operate daily bus services to Brisbane using the major corridors. The Sunshine Coast is a growing region, and has a variety of transport methods including Rail, Bus, Ferry and theSunshine Coast Airport. However, in recent years the local council has been looking at more reliant, high quality public transport options to create a ‘transport spin’ on the Sunshine Coast. One of these transport methods is the Sunshine Coast Light Rail. Flights from the Sunshine Coast depart from Sunshine Coast Airport, which is located 10 km (6.2 mi) north of Maroochydore, and fly direct to Sydney, Melbourne and Auckland with Jetstar, Virgin Australia and Air New Zealand. Queensland Rail Citytrain‘s Nambour and Gympie North railway line operate interurban services daily, with most trains running express between Caboolture and Bowen Hills stations. The train lines run through the Sunshine Coast Hinterland, with buses connecting to the coastal strip. Further north of the Nambour station, commuter trains operate twice per day. Bus services are operated by Sunbus, which operates under the TransLink public transport system. These buses connect the suburbs and localities within the Caloundra, Maroochydore and Noosa areas. Sunshine Coast Region & Noosa Shire Council operates zero-farebus services throughout the coast to surrounding suburbs and major park and ride stations during the peak summer holiday period.